From doctors to school teachers and everyone in between, name tags are essential for professionalism! Whether your job is in the food service industry or you are a CEO of a major corporation, showing professionalism by wearing a name tag is sure to make your job a bit easier. By attaching this simple item to your uniform or daily attire, you will stand out from all of your competitors. And, they make corporate branding a breeze by identifying employees at a store even easier. 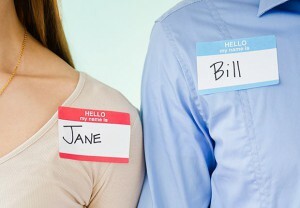 Here are some pointers on how name tags can help perfect your professionalism. Maintaining a corporate uniform, whether certain colors or specific attire, is significant for many businesses. Adding a name tag to that uniform helps with your appearance and identifying where in the company you fit in. From a mail room attendant to the president of the company, not everyone will immediately know your name. But, by wearing a name tag as part of your uniform or daily attire, you are encouraging interaction and promoting company branding. From color choices to adding a text, a name tag is an important piece to add to your wardrobe. And, with so many colors and materials to choose from, finding that perfect name tag is easy. Logos and graphics are also an ideal way to promote your company from within and throughout each day as every employee interacts with clients, customers and the general public. 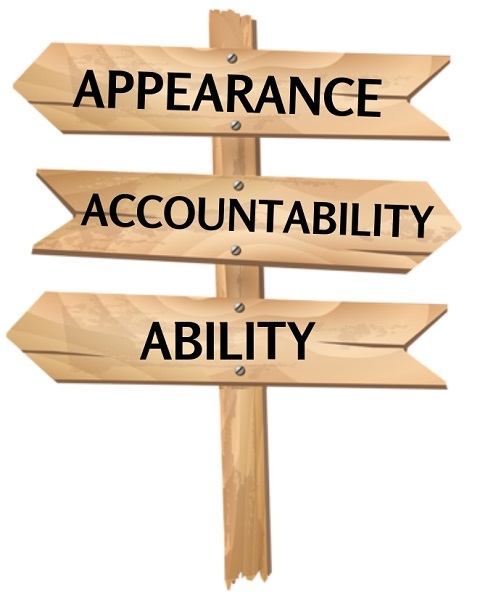 Remember that appearance is key to most professions. And, maintaining that professionalism is easy with the proper name tag. It is always important to hold yourself accountable for your actions when working. By wearing a name tag, not only will you maintain that accountability, but you will also increase your professionalism. 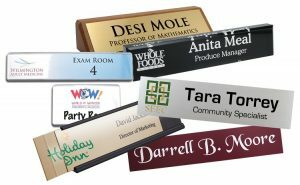 Name tags can also increase productivity because when someone is wearing identification, it tends to make them more responsible and aware of their actions. Whether it’s a difficult situation or merely representing the company at an event, name tags are sure to help with keeping employees accountable and maintaining professionalism. Professionalism is about focusing on finding a solution. And with a name tag, finding that focus has never been easier. By holding yourself accountable, you will develop necessary job skills, keep up with time management and find any needed solutions for your company. 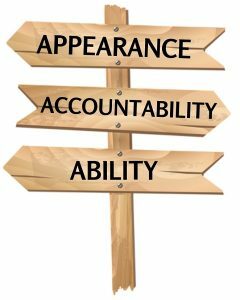 These abilities are essential for keeping a strong work ethic and showing others you can be professional. So, stay on task and show your professionalism by wearing a name tag! By identifying yourself, you show others you know what you’re doing and that you’re proud of it. This becomes part of who you are and helps to maintain the stigma of a job well done. From holiday decorations to home and office furniture, making something yourself feels great! These days, it’s all about making something with your hands of which you can be proud. And name badges are no exception. Here are several examples of available DIY name badges. This three piece system is customized using only a printer. Print on the removable insert and then add it to the window-style frame with the plastic cover. These inexpensive and simple to assemble badges are perfect for high-turnover positions. 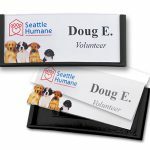 Add a logo to the metal backplate on these reusable name badges. Then customize each one with a printed name and snap everything into place using the plastic lens cover. They are perfect for a professional look while maintaining a budget. These two reusable name badge systems are designed specifically to help make your name badge needs effortless. 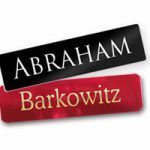 Making each name badge is easy and quick, which makes them perfect for high turnover and seasonal positions in offices and retail establishments. Badge holders come in several sizes and either a horizontal or vertical orientation. Printable inserts are available in eight different colors and are perforated for easy use. If your printer can print it, you can make it! From printing names and titles to graphics and multiple colors, these badges have it all. Making these personalized badges is as easy as adding the information you need and hitting print. And, each badge holder is reusable. Need something you can write on? 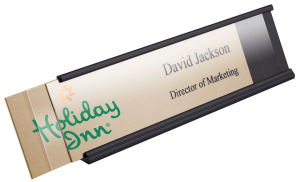 Because they are so easy to use, these stick-on name badges are perfect for temporary use and are ideal for meetings, parties, conventions and other events. 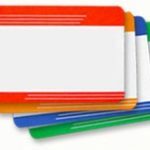 Use these Name Tag Blanks in a variety of ways. Add names and titles with a sticker or label maker. Or, use a marker for a more permanent solution. 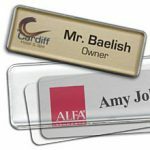 Add a logo to any reusable name badge to make them stand out. Choose from laser engraved, UV Color or hot-stamped printing processes. Adding names, titles and more to these name badges is the easiest thing you will do all day. Grab your nearest pen or permanent marker (careful if you’re using name tag blanks as you may not be able to reuse them) and write down all the information you need on your name badges. It’s a real DIY! Need something a bit more permanent for personal identification? We have that too! From walnut to black piano finish, we have a custom plaque for you! From homes and offices to shops and restaurants, a custom plaque will complement any decor. Add store policies or available office hours and post it near the front door. Or, add a favorite quote or company motto and display it on a bookshelf in an office. 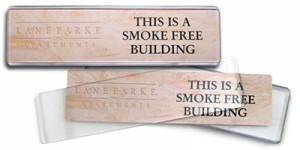 But no matter what solution a custom plaque provides, remember the engraved plate can be customized in any way needed. Choose from a variety of plate colors to enhance each plaque. Customize each metal plate with almost any needed text and graphic or logo. From simple to complex, these plaques are perfect for fancy signage nearly anywhere. 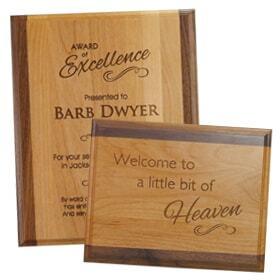 Perfect for families and organizations with a budget, these plaques come in a variety of finishes, so there are plenty of options to choose from. 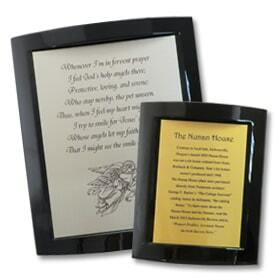 Value Plaques are made to provide customers with the beauty of natural wood at an affordable price. Some Value Plaques resemble different types of wood such as oak, cherry and mahogany. Others resemble unique materials like marbled stone. But what all Value Plaques have in common is an attractive finish that creates a beautiful border around a custom engraved metal plate. Made of genuine wood, these Standard Plaques are sturdy and have a natural color and grain pattern. Everyone will enjoy the look and feel of red alder, oak, walnut, cherry and other available options. And, the wood and metal plate create a striking contrast which will catch anyone’s eye. Some Standard Plaques are less expensive than some Value Plaques. This depends on the type of wood from which they are made. 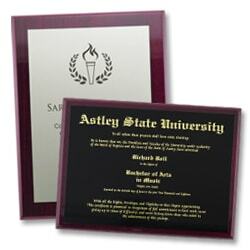 So, these plaques can stay within a company’s budget while providing the beauty and durability of real wood. The quality of each Premium Plaque makes them perfect for celebrating special occasions and recognizing distinguished accomplishments. Made of solid wood, some Premium Plaques have detailed designs that give them a sophisticated look that suits any formal event. Others look very similar to Standard Plaques, but the quality of the oak, cherry or walnut gives these Premium Plaques a notable distinction. Because of the excellent materials and attention to details, individuals like donors and CEOs will take pride in these prestigious award plaques. No matter what purpose they serve, each custom plaque allows for individual customization. Which makes them perfect for anyone! A reinvention of anything requires a substantial analysis of what it is. 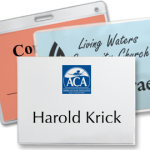 This reinvention is even true when it comes to name tags and other personal identification. Branding and using identification is something businesses have done for many years. And, it doesn’t matter what the brand is, or what they are selling to the masses. Identity is something every fashion label is obsessed with right now – what it should be, how to get it, how to bank on it. 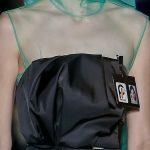 Prada is one of the houses whose distinct, powerful identity is fodder for many lesser talents, which is perhaps why the label’s Autumn/Winter 2018 collections – for him and for her – featured a sly wink and nudge to that idea in the form of ID cards clipped onto models’ collars and chests. 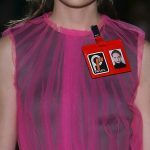 They were the kind of name tag a faceless factory worker, office drone or out-of-office visitor might be instructed to wear and keep visible at all times – Prada’s even came stamped with faux corporate identities, logotypes and symbols ironically invented by the fashion house for purely decorative purposes. 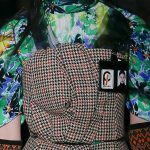 Prada has failed to peg the real issue with name tags: discovering brand and personal identity. After all, this is what a name tag is all about. We will always encourage people to wear name tags with their name and a business or corporate logo. 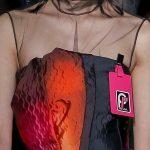 And while it seems that Prada has attempted this with their, albeit ironic, version of a corporate name tag, there appears to be a lack of something fundamental. 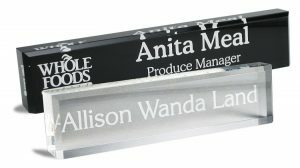 Professional tools such as name tags are essential in marketing and communication. They are necessary in providing not only personal identity but corporate branding as well. And, the primary reason for wearing a name tag is to provide an identifying feature for each person. With so many choices of name tags available, businesses only have to decide which product best fits their needs. From Hot-Stamped Logo Name Tags to Reusable Speedy Badges, the name tag world is best suited to those who know how to use it. Understanding this leads to the fact that a reinvention of this simple tool is not necessary. By adding a business or organization logo to a name tag, every employee or volunteer will be identified quickly and easily. Office and retails settings are often the place to see name tags. But, inevitably employees wear these tags when going to lunch or even on the way home. And, while they continually wear these name tags in public, a company’s name and brand becomes available to everyone they pass by. This type of branding can also be beneficial to announce special promotions, sales or events. 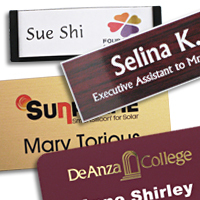 Name tags are often the most effective element of a person’s uniform in meetings, at conventions or during any event. Trying to offer a reinvention of this simple feature is redundant and unnecessary. Employees who wear name tags offer a sense of responsibility that remains unmatched by those who don’t wear identification. These identifiers have become an essential and vital part of many companies. And, they allow each employee to wear any required daily business style or uniform while remaining unique in their aspect and personality. So, why offer a reinvention of something so tried and true? Let’s leave name tags where they need to be as a part of everyday business life.